Last week I received my Nexus 5 Android smartphone. I was excited to get it, but there was one problem: the Nexus 5 isn’t compatible with Verizon. The Nexus 5 is unlocked, so I started researching pay-as-you-go, no contract providers. I based my network choices based on coverage in my area. Luckily, T-Mobile, Sprint and AT&T all provide pretty good maps on network coverage. After looking at the networks I decided to go with an AT&T-based provider. That led me to decide between AIO Wireless and Straight Talk. Straight Talk is the least expensive 4G / LTE no contract AT&T reseller in the United States. They provide up to 2.5GB of data monthly and unlimited talk and text messages. This costs about $45 a month. AIO Wireless is actually owned by AT&T. They provide a 2GB/mo plan with unlimited talk and text messages for $55 a month. You can buy additional 1GB blocks of data transfer for $10 in case you start to get close to your limit. I chose AIO Wireless for two main reasons: Straight Talk has a reputation of terrible customer service, and Straight Talk supposedly cuts your data access completely, despite claiming to put you on 2G speeds for the rest of your month. Some users who frequently went over the monthly limit reported having their service terminated by Straight Talk without notice. Signing up for AIO Wireless was easy, but required some information about my specific handset that made me wait an extra three business days before I could order and activate my phone. I had to order a SIM card in order to use my Nexus 5 on AIO Wireless. Unfortunately I couldn’t order the SIM card online until I knew my phone’s IMEI number, which is unique to each phone. AIO doesn’t have any physical locations in Minnesota. I waited for my Nexus 5 to be delivered and then completed my order online. I paid $10 for the SIM card and $55 for my first month. I was also charged $0.71 for tax, which is weird because AIO doesn’t have a physical business location here. 2-day shipping was free. I ordered at about 4:30PM CDT. I assume AIO’s fulfillment center was based on the east coast, because my order didn’t ship until the following day. 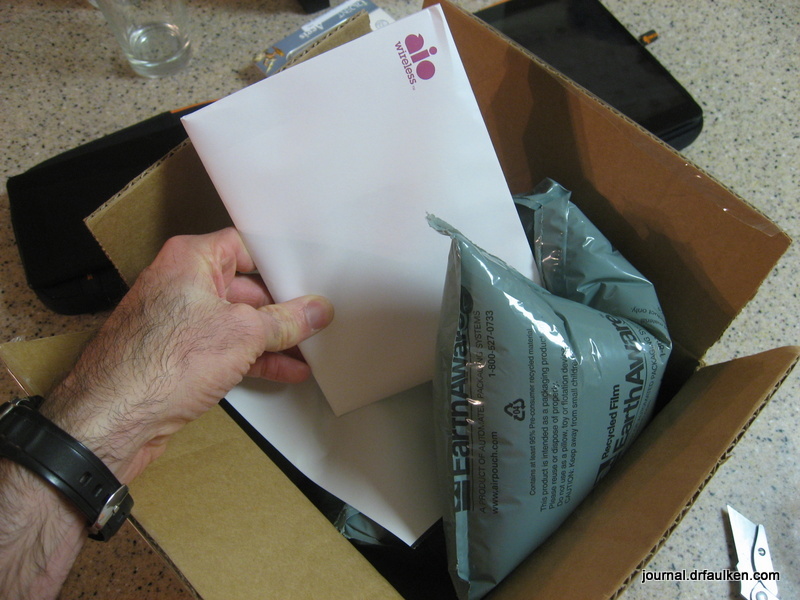 I commend AIO Wireless for using air pillows to make sure the envelope wasn’t damaged during shipping. 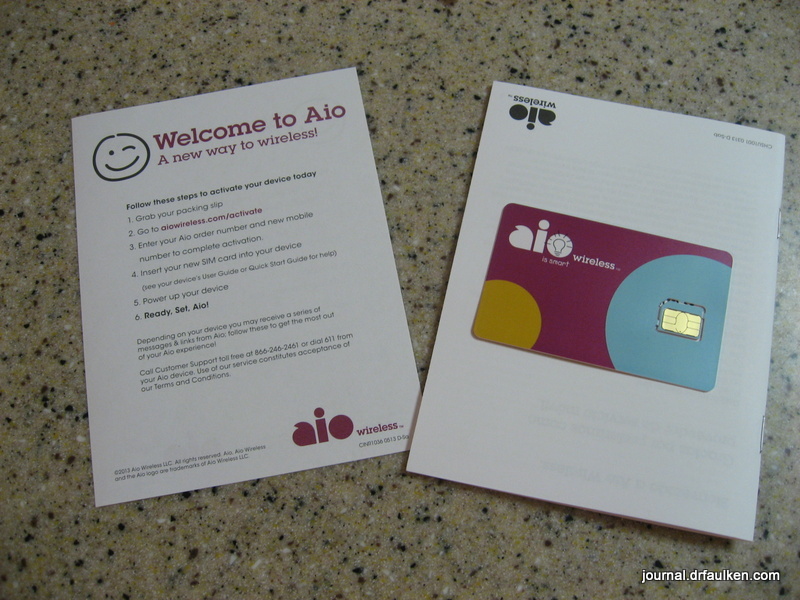 I have no idea why AIO Wireless didn’t just ship the SIM card in a padded envelope similar to how many retailers send SD / microSD flash cards in the mail. 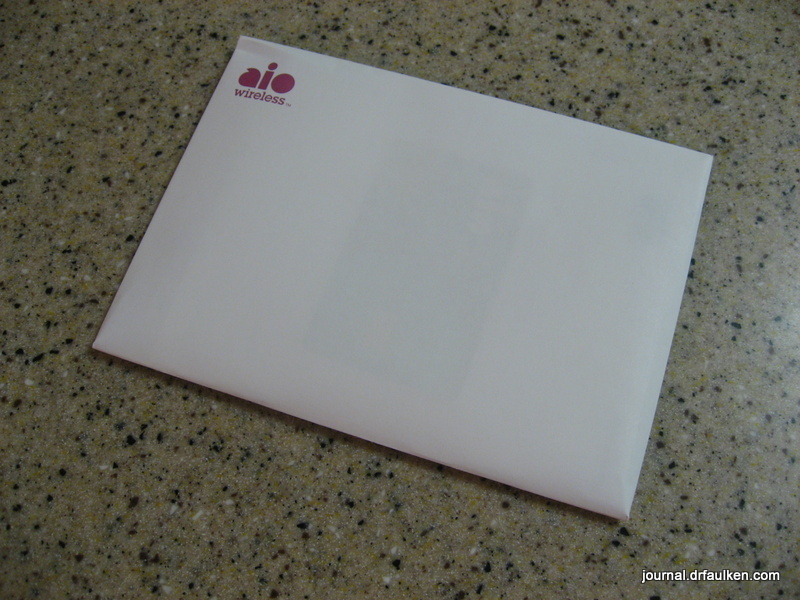 I assume AIO is concerned about the SIM card going through a sort roller, but if they add enough padding inside of the envelope it will get processed differently from thinner envelope-based mail. I installed the micro SIM card without difficulty and turned on my phone. This part should have been straightforward. 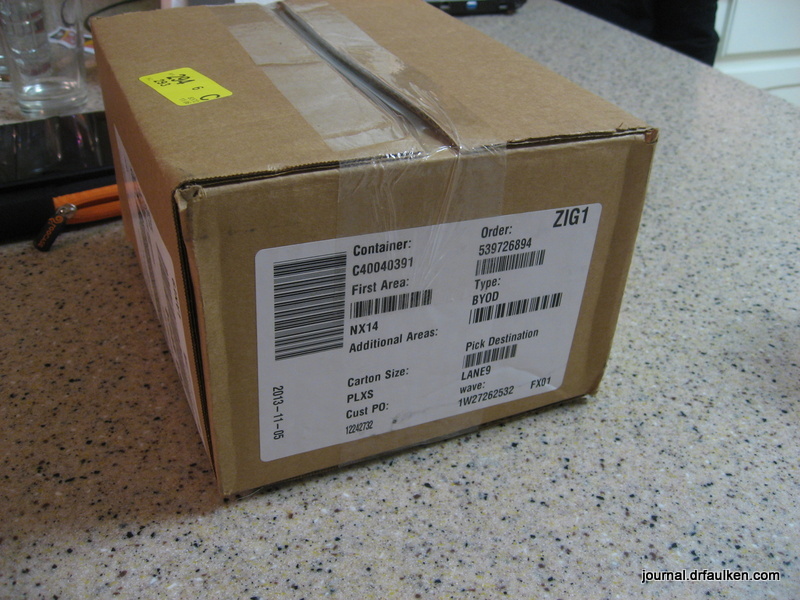 I created an account on AIO Wireless and entered my phone number as indicated on the packing slip. AIO Wireless sent me a text message as confirmation, and I had to enter the code in the text message on the Web site to complete my signup. The problem? Android 4.4 (KitKat) uses Google Hangouts to handle all text messages. In order to receive text messages in Google Hangouts I had to enter an authorization number that Google sent me. I didn’t figure this out until I used AIO’s Web site to send me two different authorization messages. I wound up using a different authorization system on Google’s Web site and asked AIO for a third authorization code. I got it, typed the value into the AIO Web site, and was good to go. I took my Nexus 5 to work the next day. I had been using my phone on my employer’s wireless, so it wasn’t until I was in the office bathroom that I noticed I didn’t get any signal. My mind raced back to all the times I made fun of my friends on AT&T because they didn’t have reception while I was still pulling down LTE speeds on Verizon. I contacted AIO Wireless through their online chat, and was ready to play dumb about poor network coverage. I asked if I had done something wrong, or needed to do something else, in order to get better reception. I’m glad I did, because the customer service technician determined my phone wasn’t set up to use their data network yet. They sent me detailed and multi-step instructions on how to set up an APN on my Nexus 5. After rebooting everything was great. I’m not sure why this didn’t happen automatically when I inserted the SIM card and/or activated my phone, but at least AIO Wireless was able to help me quickly and easily. Based on my historical usage from Verizon I know I won’t be bumping into my 2GB/month limit anytime soon, even if I go back to tethering (shhhh) every day like I did earlier this year. However, AIO Wireless provides an app that makes it easy to track usage, pay my bill, and so on. I wish they had a widget for data usage, but that’s just me being an Android UX/product manager nerd. This was the first time I brought an out-of-contract or unlocked phone to another provider. In some ways it was easier than I expected, but in some ways I was frustrated by waiting or by the semi-automatic setup. I wish the brief instructions included with my SIM card or the AIO Wireless Web site had a step to make sure an APN was set up. Luckily I was able to contact AIO while next to a computer, but if I had been on the road it would have been much harder to get straightened out. From a network perspective I’m happy with AIO so far, but I want some time to go by before writing about it in any more detail. 8 Comments on "Setting Up My Nexus 5 on AIO Wireless"
Hi, I just went through the same thing myself. Aio seems to be working just fine for me as well. However, I don’t seem to be getting LTE. Do you have the same problem, if not, how would I be able to fix this? Thanks. Do you have any data at all (like 3G)? If not, you will need to contact them to get your APN set up. I do. I literally went through the same problem. Had to eventually type the APN info and data finally worked. Have the nexus 5 as well. However, I’m not getting LTE. One of their technicians said that the n5 does not supports aio’s LTE, but that doesn’t seem right. Yeah, their tech is definitely not right, as I am on the LTE right now. Have you gotten 4G on a different device on the AT&T network before? Maybe there is a problem with your N5 LTE antenna. So apparently I lied. Seconds after I sent you the message it switched over to LTE. I’m new to prepaid so I wasn’t sure how this was going to work have you had good luck with their service so far? LOL glad it is working for you. By the way any tips on the nexus 5? Ive had a nexus before, but clearly you have a few days on me on this one.